Worship Service Easter Sunday April 21st at 10:25 am. 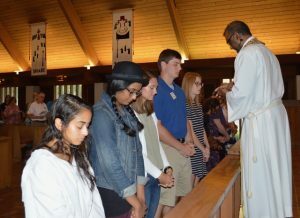 Lutheran Gator Campus Ministry is an organization of students who join together in the name of Christ to celebrate and engage in our faith- all are welcome. We’re glad you’re visiting our site, and we’d love to meet you at our events! Our home is at University Lutheran Church and Campus Center, right across from The Swamp (Ben Hill Griffin Stadium)! In addition to Sunday worship, students gather every Tuesday at 5:30 for"TACO (Theology and Campus Outreach) Tuesday". Each week we will share a meal (not always tacos, that would be too much deliciousness) and fellowship. Our month will be broken into 4 segments; Gather, Word, Meal and Sending. Gather will consist of getting to know each other and building relationships. Word will be our Bible Study. Meals (we will have dinner at every meeting) will consist of sharing food and worship with the congregation. Sending will be our week to do outreach of some sort. Using Ephesians 1:9-10 as our vision statement and Romans 10:14-17 as our mission statement, the student leaders extracted a working mission statement to drive their ministry: LUTHERAN GATORS invites others to join its ministry team in building, nurturing and maintaining a student led, Christ-centered community at UF!